On Palm Sunday morning, Gunipe and Grace Raju combined the children from all three churches. 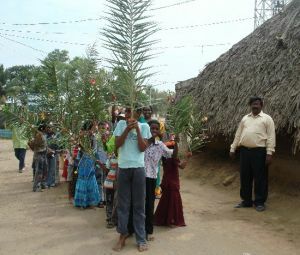 They rallied in the streets praising the name of Jesus, Hosanna, holding the palm tree branches. Gunipe says "It's really an amazing thing that these children witnessed that the Lord Jesus is the King of Kings and Saviour of the World!"